Tiverton High School has shown how alumni can play a key role in supporting students from a 1000 miles away. Former students can play a key role in the delivery of the core curriculum. Returning to their old classrooms, alumni enrich the curriculum by co-delivering lessons related to their careers, helping build students’ understanding of the real-world application of their learning whilst boosting their motivation to work harder at the same time. Tiverton High School is located in North Devon. Since many of their former students have moved away from the area, the school set out to find a way to involve alumni in the curriculum remotely. They decided to organise a series of talks, in which alumni use Skype to teach lessons on subjects related to their careers. The featured image is of Sally Hill, now owner of her own Scientific Translations company in the Netherlands. 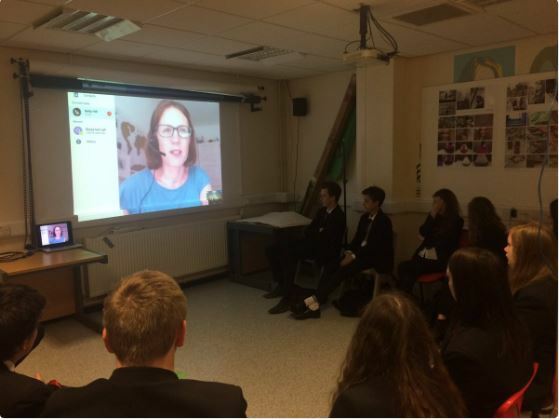 Sally skyping into a Year 10 geography class to talk about International Labour Markets, which the students were studying at the time. Thinking of involving alumni in lessons? Get in touch with your alumni officer to get a copy of the ‘In Curriculum: teacher toolkit’.